Hearing protectors are labeled with a Noise Reduction Rating (NRR) that is derived from laboratory measurements of the attenuation provided to trained and motivated human subjects in a ‘sterile’ environment. As intended, these measurements represent a best-fit condition. The literature indicates that the average attenuation provided to end-users of hearing protectors is often only a fraction of the labeled values. To learn more about the practical alternative to relying on the NRR, click here. 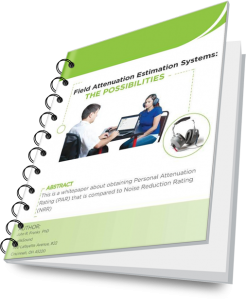 Custom Protect Ear would like to present a FREE WHITEPAPER about obtaining Personal Attenuation Rating (PAR) that is compared to Noise Reduction Rating (NRR).